When Anthony Van Dyck (Flemish, 1599-1641) made these three paintings, he was between 19 and 20 years old. All three were owned by Peter Paul Rubens (Flemish, 1577-1640), and were bought from his collection by the Spanish royal family after Rubens' death. That Rubens had them in his private collection says a great deal about his admiration for Van Dyck. Rubens was 12 years older than Van Dyck and had hired him to work as his chief assistant in his studio. "Assistant" doesn't do enough justice to Van Dyck, who was young but extremely competent. Even today, scholars have a difficult time distinguishing between the two artists' work during the period they worked together. In this first work, Christ is betrayed by Judas, who leads a crowd of Suducees and Pharisees (i.e. member of the ruling Jewish priesthood) to take Christ into custody. Christ had just offered his interceding prayer in the Garden of Gethsemane, while three faithful apostles (Peter, James and John) had fallen asleep keeping watch. 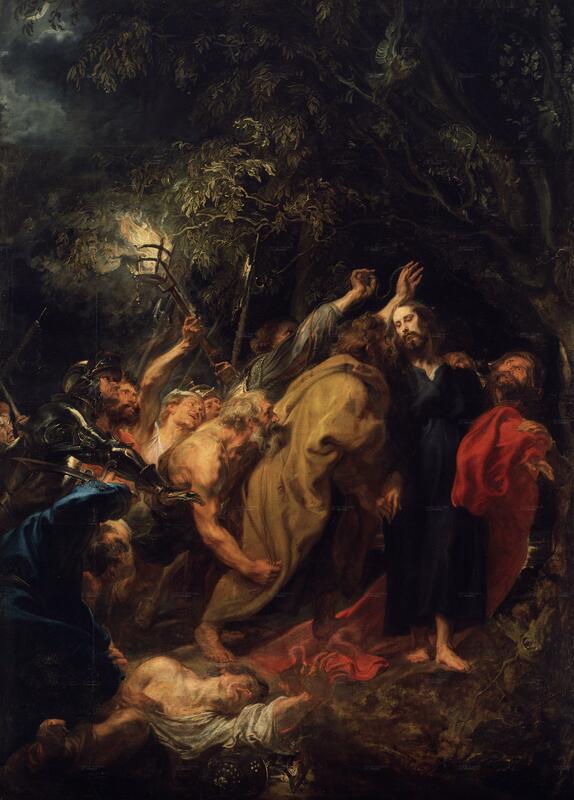 Van Dyck brilliantly creates a torrent of action swooping in towards Christ, the only figure with two feet on the ground, effectively stopping the large crowd by himself. The contrasting patches of dark and light, red and black create an emotional upheaval. It's an unsettling painting, and, with figures at almost real-life proportions, imposing. Looking at this painting, its hard to know whether you are in the prison, and therefore an accomplice, or, like the figures in the top left of the painting, looking through a window. In either case, you have a front-and-center view of the scene. 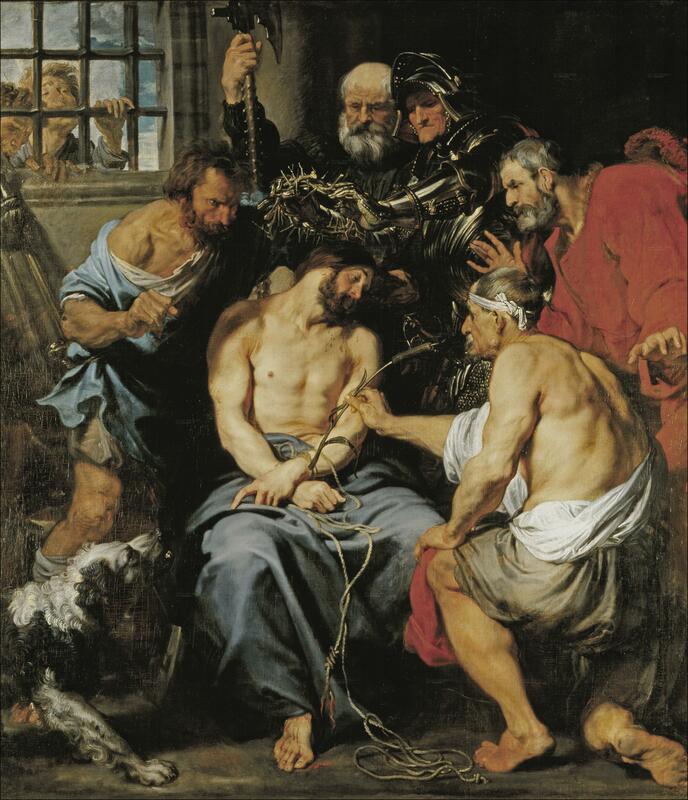 Christ is being crowned with thorns by Roman soldiers. Van Dyck uses an astounding arsenal--especially given his young age--for his cast of characters. Armor, dog fur, the weakened, pale skin of Christ, the young, healthy skin of the Roman soldiers, wood, sky, rope . . . up close (click on the image for a much larger version) and in person, the brushwork is incredibely varied and the pallet rich. Though not overtly Christian to us today, this painting would have been an obvious reference to Christ's saving role. It depicts a story from Number chapter 21 in the Bible. Jehovah sent poisonous sepents among the Israelites, and many were bitten. He then commanded Moses to create a brass serpent and put it on a pole. Any person who would look at the brass serpent would be instantly healed. Many did not look, and died. According to the book of John chapter 3 verse 14: "And as Moses lifted up the serpent in the wilderness, even so must the Son of Man be lifted up." Van Dyck painted this for a very Bible-literate audience that would have understood the reference to Christ. All three of these paintings hang in the same room, but separately, at the Prado Museum, but I don't know if there were meant to hang together. 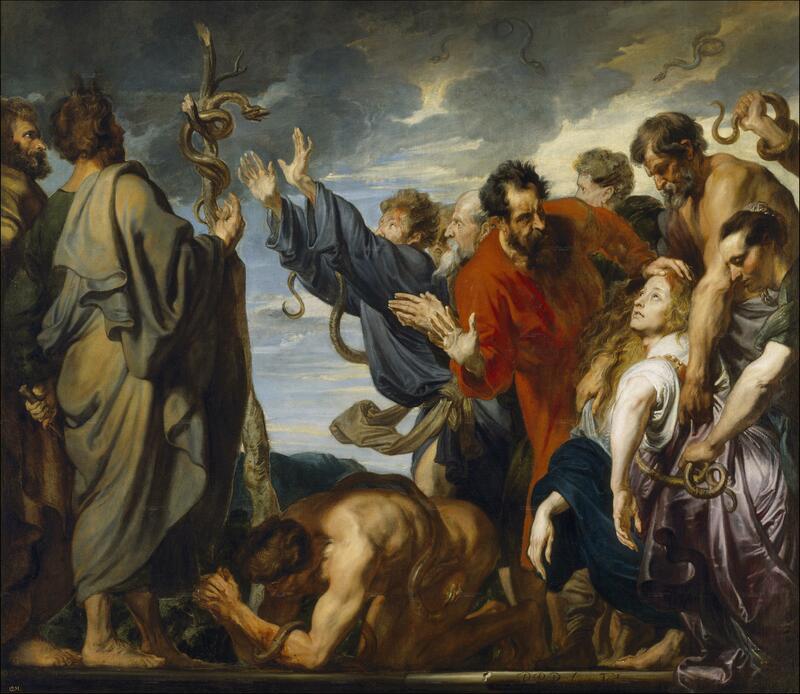 Sometimes I wish The Brass Serpents were hung to the right of the The Capture of Christ. The symmetry and dates of the three makes me wonder if they were meant to be together, perhaps with the Crowning of Christ with Thorns in between. In any case, have a wonderful Christmas.